When I was living in Turkey, one of the most anticipated time of the year for me was the Aşure (ah-shu-re) day. 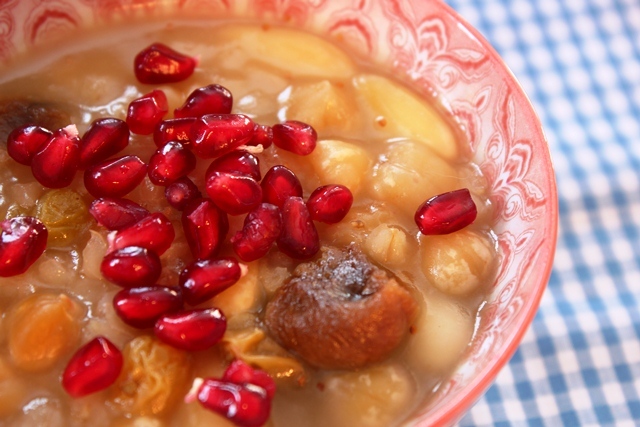 Aşure is a type of dessert that was believed to be made by Noah with the food items left on the ark after the Great Flood. The ark is also believed to be resting on Mount Ararat which is located on the eastern part of Turkey. The story and the search for the ark always fascinated me and of course the promise of a great Biblical discovery has lured many researchers to the location. Last year, there was even a claim that a group had found the ark. According to the lunar calendar which is the basis for Islamic events, it is supposed to be on the tenth day of the month Muharram. Lunar calendar drifts 11 to 12 days a year so all the fasting, Islamic observances and celebrations move 11 to 12 days earlier each year. This year, Aşure day is supposed to be at the beginning of December. Traditionally, everyone makes a big batch which has a consistency of a thick soup/pudding and shares with their neighbors. So not only we made bowls of bowls of aşure at home but also got to taste many different versions from our family and friends. The ingredient list might sound very random but it reflects what could have been left on the ark. 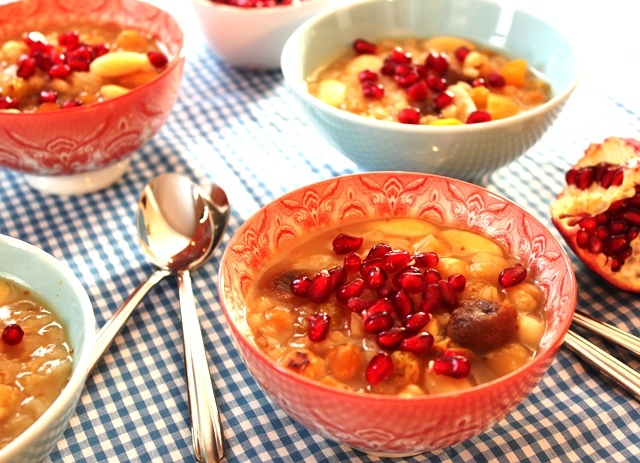 Traditionally wheat, rice, navy beans, chickpeas, dried fruit and nuts are used with a touch of rose water at the end.Everyone has their own version of this filling dessert. My grandma includes rice and navy beans whereas my aunt omits navy beans. I usually follow my aunt’s recipe but this time I did not include rice, the only grain was the wheat. It is a tradition for us to visit my hala, my father’s older sister, on asure day. We help my hala and my cousine, Handan, to make aşure by painstakingly removing the skins from blanched almonds and walnuts in the morning. If you don’t peel the brownish skin off of the walnuts, it will darken the color of your asure. Figs also darken the color so they are are added right before sugar. First, wheat cooks on the stove, bubbling away. Then all dried fruit and chopped nuts are added, brought to a boil one more time. Sugar is added at the end, the aşure is ladled in small bowls after sugar melts.All measures for dry fruits and nuts below are approximate. Adjust based on what you like. The only thing I pay attention is to use sugar and wheat at the weight ratio of 1:1. This makes it just sweet enough for me. 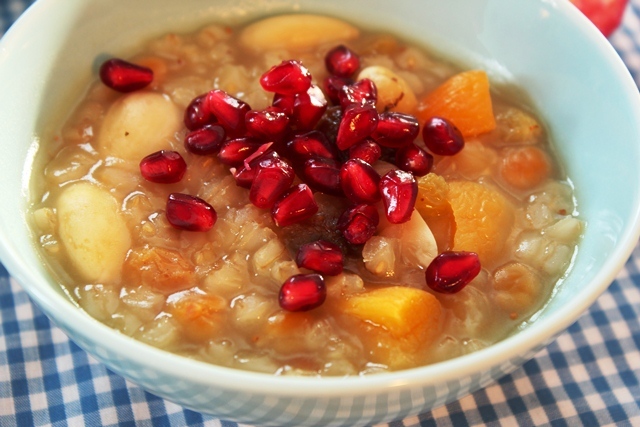 After aşure comes to the room temperature, it is garnished with chopped walnuts, pistachios or pomegranate seeds, and moved into the fridge. I like it cold, right out of the fridge. I consider this dessert a great breakfast as well. Some sugar, some grains, some protein all piled up in a bowl fill you up and get you going in the morning. What else could you ask for from a breakfast? Recipe: Courtesy of my Hala. 1. Wash wheat several times, drain, put in a big, deep pot. Cover with several cups of water until water is 2 inches above the wheat level. 2. Stirring frequently, cook wheat for 20 minutes on medium heat. 3. Add rice if you are using, keep cooking until all the wheat and rice is cooked. Add water occasionally to keep it at a thick soup consistency. 4. 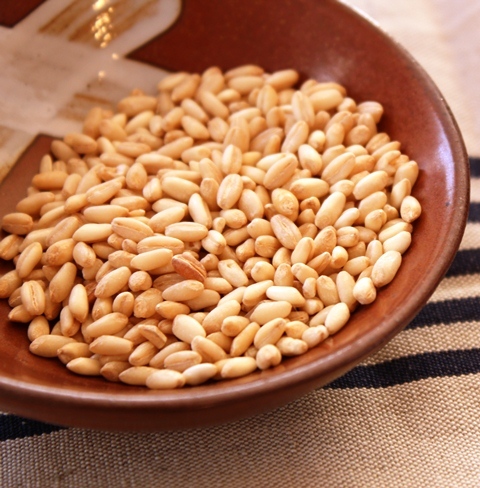 Once wheat and rice are soft and cooked thoroughly, add chickpeas, almonds, hazelnuts, golden raisins and apricots. Add enough water to keep the consistency as a thick soup.Bring it to a boil, then turn it down to medium heat again. 5. Add figs and sugar. Add water if necessary. Stir until sugar melts. Add rose water, or orange juice or orange zest. Take it off the heat. 6. Ladle into bowls, let them cool. Garnish. Serve immediately or refrigerate. I always love your family stories within the recipes :) Thanks for sharing your family with us! I don’t think I have ever had anything like this…it looks so pretty and appealing. Thanks again, Ilke, for sharing your family stories and recipe with me. Oh wow, asure sounds wonderful! 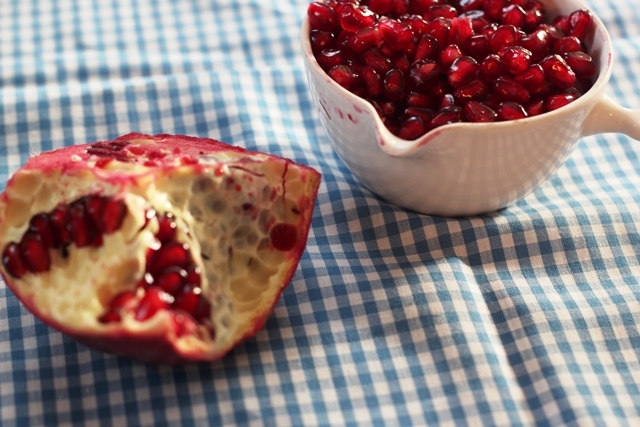 I love your turkish recipes so much, and your photos are stunning, the pomegranate seeds just pop with ruby translucency! Oh, how I wish I had natural light, PLUS your photo skills :) I hope you try the pie, it’s so amazing! So lovely! What a great tradition. This looks delicious. I agree, it would make a perfect breakfast. Your Hala’s asure looks terrific! It sounds way better than the yogurt and granola with pomegranate seeds that I’ve been eating for breakfast lately. I hope you and yours have a great Thanksgiving! That looks absolutely delicious and your photos are stunning, as usual. I love the unique combination of ingredients. I stumbled upon your site 2 days ago, and I really liked it!! You do a very good job with the recipes and a pics and the stories!! Thanks again!! I’m sure I will visit your site often!! …yummmy. 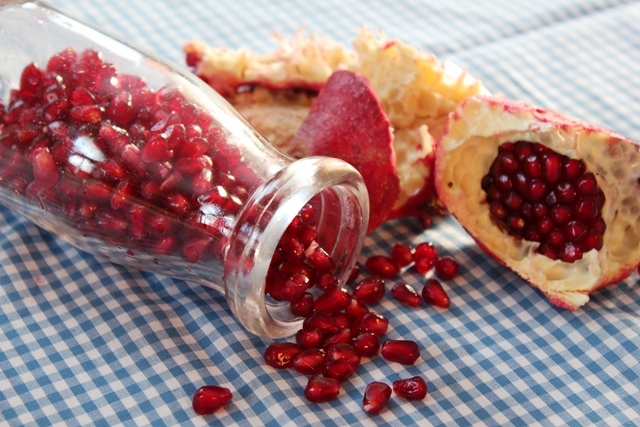 I have never made this before but will now with your recipe….otherwise in Izmir I always would order it at Özsüt Cafe. Thanks for sharing your fab recipe.